Ghee is basically clarified butter which is made by gently simmering unsalted butter until all the water has evaporated and the proteins have separated. This process gives the resulting product a very high smoking point, around 250 degrees Fahrenheit, which makes ghee perfect for tempering spices and also for frying if you so desire. Ghee can be purchased from most Indian grocery stores and also other specialty stores however, making it at home will save you some money and also ensure your ghee is fresh and pure (vegetable oil is sometimes found in low quality ghee). So, without further digression, here is the priceless recipe. 1. Remove the butter from the packaging and place in a heavy-bottomed, large pot on medium heat. Once all the butter is melted, lower the heat to as low as it will go and let simmer uncovered. As the butter is simmering some of the milk solids will rise to the top. 2. Keep simmering the butter, checking on it every now and then to make sure it is not burning. 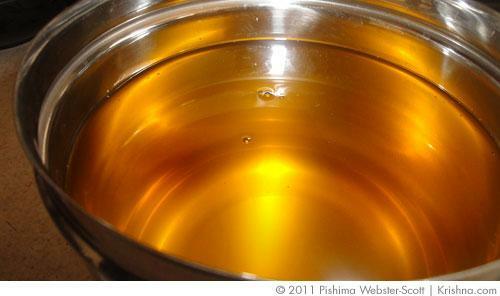 You will know the ghee is ready when it turns a clear golden colour. 3. When clear remove from heat and allow to cool for a while in the pot. Then strain through a thin cotton cloth to remove solids. Be very careful during this process as the ghee is still very, very hot. I like to strain the ghee into a stainless steel container with a tight lid for storage. Ghee will keep for a few months in a cool dry environment. Make sure to use a clean, dry spoon when taking ghee to use from your storage container.